Home movies. Parents make them. Neighbors hate them. Why? How could everyone not love something that someone is so passionate about? The time has come to talk about the concept of “Science Home Movies.” Same for environmental ones as well. HOME MOVIES. 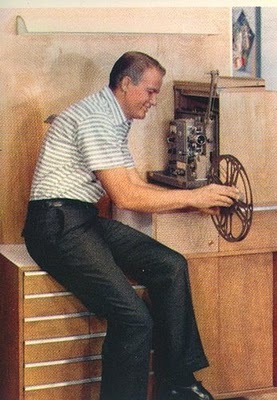 Here’s Dad with his movie projector. He’s getting ready to show movies of the kids on vacation, at the park, riding their bicycles, splashing in the pool. His neighbors are coming over for the evening. They don’t know that after dinner Dad will be pulling out the projector. Dad is sooo passionate about his kids. Surely the neighbors will love the movies as much as he does. Maybe he’ll also talk about his scientific research on bopyrid isopods. He’s passionate about that, too. Last Thursday night, I drank a couple of cocktails and woke up in the belly of the beast at the back of the ballroom for the opening night of CPAC, the Tea Party party in D.C. They are a case study in the limited power of rage-based motivation. It doesn’t work in the long term. And the climate crowd shouldn’t let themselves fall victim to it. 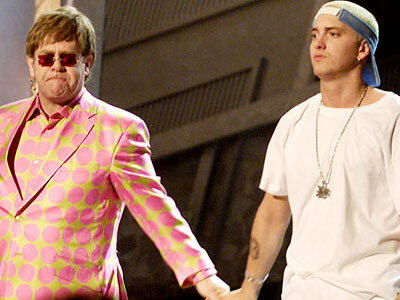 HOMO AND HOMOPHOBE – In 2001, at the height of Eminem’s perceived homophobia, openly gay musician Elton John performed with him at the Grammy’s. Why would he do such a thing? Last month I AROUSED the videomaking interests of 25 Norwegian science graduate students at University of Tromso with our three day videomaking workshop. They, in turn, FULFILLED my hopes and dreams by doing the best job ever of producing 5 one minute videos in just 48 hours of effort. And now they are doing the magical third part — actually FOLLOWING THROUGH with their newly aroused interests by keeping the flame going after I’ve left. DOESN’T GET MUCH BETTER THAN THIS. I have to post this video again. I really can’t get over the motivation level of the Norwegian students. While doing our videomaking workshop they had a friend shoot “the making of” footage, then after I left they put it together into this amazing video. That’s never happened before in the 8 previous runnings of this workshop in the U.S. In the beginning, as an “educator” (blah, what a foul tasting term) you hope to light fires in minds. But then, over the years, as you see how hard it is, you eventually let go of that crazy notion and just hope you can do something that the students will at least not hate. At Scripps we have definitely lit some fires in minds with our videomaking workshop over the past 6 years. A number of students have gone on to produce their own videos as part of their science work, or gone entirely into video production. For pretty much all of them the workshop was their first experience with making videos. So we’ve seen some flames ignite. But what’s happened in Norway has turned into a bonfire. Yesterday the students copied me on yet another email about their on-going meetings with administrators at the University of Tromso. They’re locking in funds for further workshops, courses and films. I’m too swamped right now to follow the details (just back from Puerto Rico where we had a great “Video Analysis” workshop at the Aquatic Sciences Meeting), but I can see from the level of activity there’s no sign of the fires subsiding. It’s been revealed there will be no cheerleaders at the Super Bowl this Sunday. What a perfect opportunity to promote science. As follows. Last fall Darlene Cavalier presented to the world for the first time, at the U.S. Science and Engineering Festival in Washington D.C., the first team of 10 “science cheerleaders,” who are or were all NFL cheerleaders with graduate training in science. I shot this video of the event which has scored over 100,000 views on Youtube. Now there’s a perfect opportunity to scramble a dozen of her Science Cheerleaders, show up in Dallas in the parking lot of the Super Bowl, and put on a show that is both funny and promotes science. A CHEERLEADERLESS SUPER BOWL: This is a job for the Science Cheerleaders! Darlene would do it. She has a list of 50 NFL science cheerleaders, a dozen of whom I’m sure would jump at the chance to do it. And I’d do it and could find a cheap video crew through Craigslist, just as I did in D.C. It would be IMPULSIVE, but that’s how you put “the pulse” into a dry subject. Just need a few bucks to support it. But nooooooooo. This is called spontaneity, something that is not allowed in the heavily cerebral world of science. And yet, spontaneity, as I discussed in my book, is an increasingly powerful part of mass communication and, among other things, is at the core of the massive popularity of reality shows. 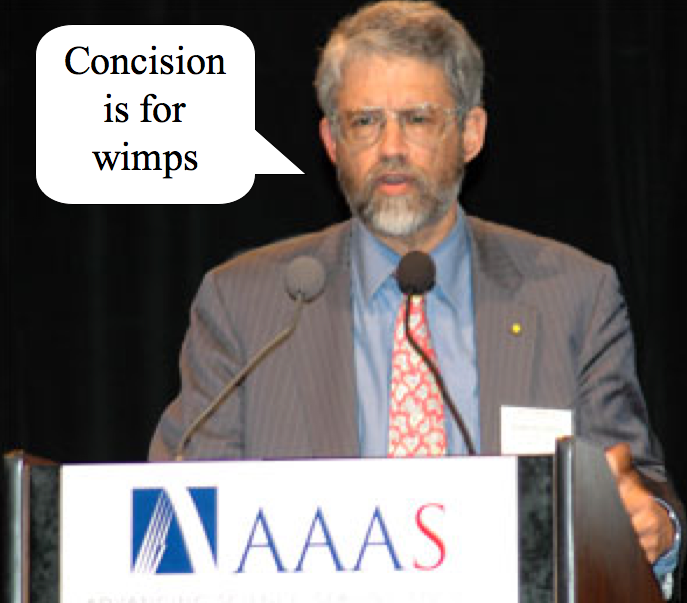 You want to know why science communication is so “bo-ho-ho-ring” as I’ve said on Andy Revkin’s NY Times blog more than once (a writer at the Spiegel even picked up on the term)? This is one of the prime factors — no interest or room for fun. And more seriously, SPEED has increasingly become the most important variable in communication. That’s what I’m talking about here.